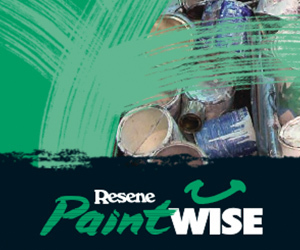 Resene’s PaintWise initiative, a cradle-to-grave paint recycling programme, has recycled over three million paint containers and found innovative uses for leftover paint. So far the initiative has recycled 400,000kg of steel and over 200,000kg of plastic. More than 500,000 litres of solvent-borne paint has been sent to solvent recovery and over 250,000 litres of paint has been donated to cover graffiti and other community projects.